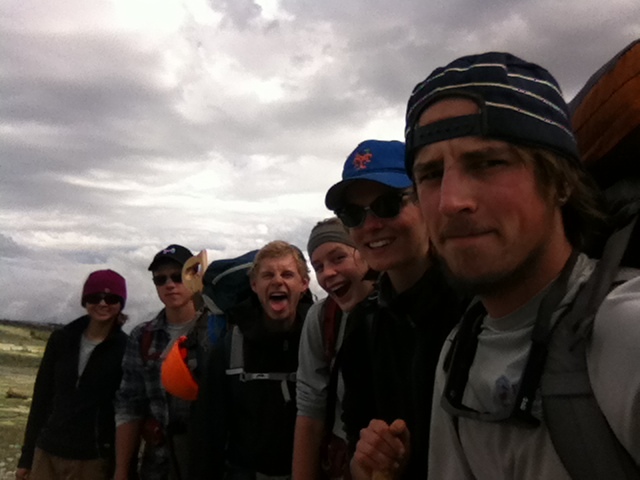 This week Boulder Crew went on their first overnight trip at Lost Lake near Hessie Trailhead in the Indian Peaks. We were lucky to have Geoff join us on Wednesday, He helped us break down excessive campfire rings at the nine campsites along the lake. Over the two day period we managed to takeout 30+ fire rings along the lake, which truly has only nine designated campsites. The rings had trash and broken glass in them which we collected and packed out. We also helped Paul with the removal of hazard trees around the campsites. There was a giant thunder and rainstorm that passed over the lake that night so we all got pretty soaked. We were excited to watch the storm though! Some of us even went swimming in the rain. 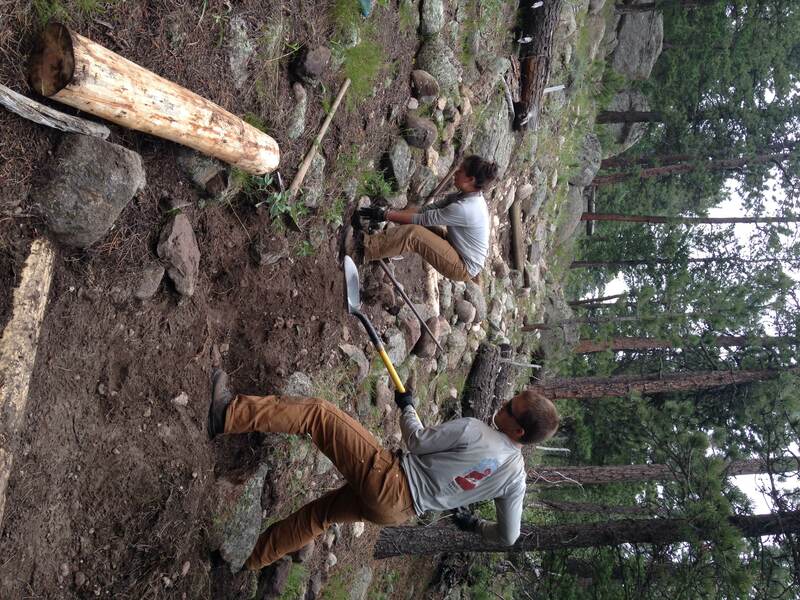 Friday we set up for a volunteer project with the Boulder Mountain Bike Alliance. Prepping trees to be placed for a turnpike, many of us got extremely sappy peeling the bark! We also had to carry two logs 100+ feet down a swampy hill to be placed on the trail using four log carriers and eight people. On Saturday morning we got right to work with the volunteers who were enthusiastic to get out in the field. The turnpike was being placed in a low laying, swampy area, so getting muddy was the only option. We made a lot of progress with the trail, which gets a ton of traffic due to its proximity to two campgrounds. We’re feeling pretty melancholy at the prospect of only one more week in Ned. It’s been such an incredible summer. Red Feather began the week full of vigor and enthusiasm as we learned that we’d be embarking upon our very first backpacking trip of the summer. Our destination was Brown’s Lake, a beautiful location within the Comanche Peak Wilderness. Loaded down with food, water, and gear, Red Feather hiked up and down the steep terrain. After what seemed like a few hours, we arrived at our campsite. 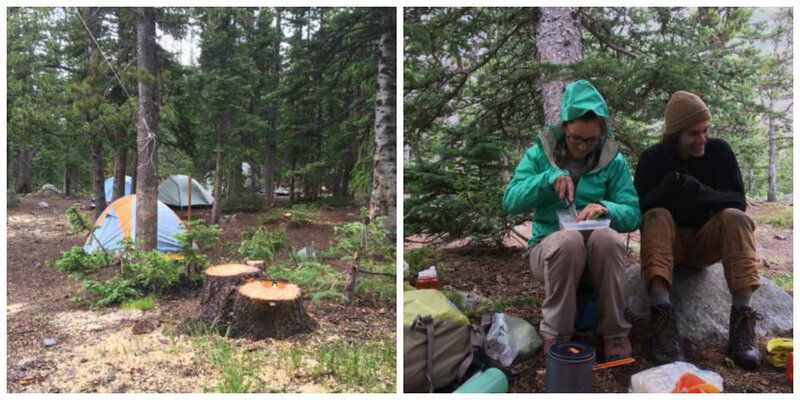 Luckily we prioritized setting up a tarp-covered kitchen area, because not ten minutes after we ended our hike did the skies open up. And I’m not talking rain. On most major news networks back home, there’s a brief interruption, usually around seven o’clock, where they announce the daily lottery numbers. Typically, there is a bunch of white balls, each with numbers on them, which are flying around a little tank. When it comes time to select a lottery winner, one ball is randomly chosen from each tank, and someone, somewhere, has a great day. Having never experienced hail before, I felt as though I was standing inside one of those tanks. The little white balls pelted the ground and punished our tarp for the better part of an hour. Fortunately the storm passed and we were able to set up our tents before heading out to work for the remainder of the day. We split up and conquered the Beaver trail, with half of us making it all the way to the Comanche Reservoir. Clint and Rebecca prepared dinner that night, and we were glad to be dry and able to laugh about the day’s happenings. Clint woke up early Tuesday morning to go fly-fishing in the lake, and was rewarded with a few good catches. The rest of us prepared for a full workday on the Flowers Trail. We would be hiking out of Brown’s Lake later that evening to find a new camping spot closer to the trails we were charged with repairing. But first we had work to do. After splitting into two groups (bucking group and tread group), we hiked up the Flowers trail and bore witness to the majesty of the region. It was great while it lasted. At almost the exact same time as they had the day before, the skies again opened up and dumped hail on us. It was a more powerful storm than the previous one, and we didn’t have a tarp to protect us. Separated by about a half mile, the two groups hunkered down in the trees and attempted to outlast Mother Nature. The hail was brutal, and coupled with dropping temperatures did well to make us miserable for well over an hour. When we eventually did reconvene, the prospect of returning to Fort Collins was brought up because of how bad the weather had become. After making sure there was no more lightening, we hiked out to our silver Chevy. The hike went well and the blue of the sky only spelled promise for the salvaging of our week. It was decided: we would remain in the wilderness for another day. We were lucky enough to find a camp spot next to the road, and began to settle in for the coming night. Clint was able to build a fire using wet wood and witchcraft, while Joe suspended a huge tarp above the kitchen area. It was about seven at night and tents were being assembled. Jay and Joe were cooking tortellini on the gas stoves. There were nine minutes left on the cooking timer when it happened. The hail had been stalking us through the wilderness like a vindictive specter. It was careful not to throw itself upon us until we were entirely unprepared. 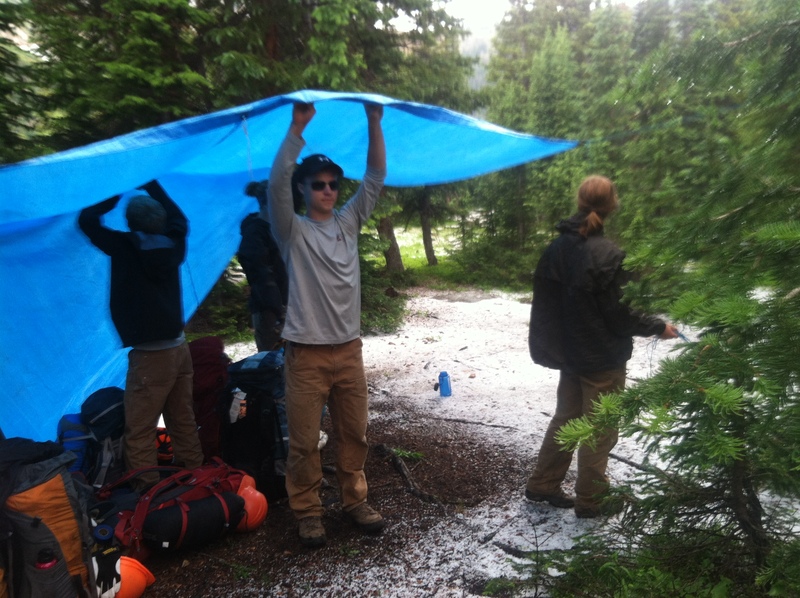 The tarp was immediately ripped from the trees, exposing our unfinished meal to the storm’s wrath. Clint’s burgeoning fire was snuffed out like a…like a fire in a hailstorm. Despite being blindsided once again, Red Feather maintained its composure, recovering the tarp to at least partially conceal our kitchen and our dignity. Clint immediately declared a campsite evacuation, and called for a rapid extraction of both crewmember and gear for a hasty retreat to Fort Collins. With two minutes left on the timer, the tortellini was strained and rationed out. It was surely the fastest meal in RMC-CC history. We wolfed down the pasta, all the while engaging in a tug-of-war with the swirling winds over the possession of our tarp. In maybe 10 minutes we went from a half-assembled campsite to a completely dissembled and hastily packed up Chevy Silverado. Everyone appeared to be doing two things at once. Wednesday began slightly later than usual due to the events of the previous night. The day had already been declared a “safety day” where we would work from Fort Collins. We sorted out gear that had been strewed about during the madness of our frantic retreat, cleaning and repairing what needed our attention. Among these items was our Chevy Silverado, about which the crew is ambivalent. Nonetheless, it received a “deep clean” and thorough inspection. I’ll have you know it is in perfect condition and looks much better than Rawah’s. After lunch we went off to buy some more supplies. Two consecutive weeks of camping had drained us of our precious cooking gas. All in all it was a good day. We returned to the notorious Bulwark Trail for some bucking. There was plenty of work for us to do, with situations of varying complexity satiating the crew’s thirst for problem solving. Or something like that. We done cut some trees. We done ‘em good. However bumpy it may have been at times, I don’t think any of us regret this week. Amongst the tribulations and times of peril were instances of triumph. Michaela in particular conquered many a physical and mental hurdle as Red Feather embarked on perhaps its most hiking-intensive week yet. It is often in the most trying of times that the greatest of bonds are forged. When the storm found us on Tuesday night, Red Feather responded brilliantly. It may have only lasted minutes, but our dismantling of camp may have been our greatest moment as a crew yet. It was honestly a bit of a blur, but looking back I think I might know why. We acted on instinct alone. There was no time for debate or discussion. None for discord or dissent. There was only a goal, and we were able to find a means to accomplish that goal with a cohesive and effective response. If our instincts did in fact give rise to what occurred in those ten minutes, then that only speaks volumes to how far we have come as a crew. The Estes Crew had a solid week at Wild Basin putting in checks at the Sand Beach trail. We were able to finish the project that was started by the other Estes crew. We were able to put in about twenty-five wood checks replacing the old rotted ones that had been there for fifty or so years. I can happily say that the trail is now much improved and is much easier to hike as well as support itself during times of heavy erosion from rainfall. This 200 meter section of trail should be able to support itself for another fifty years. As of Monday, July 14th 2014, both Estes Crews switched roles. 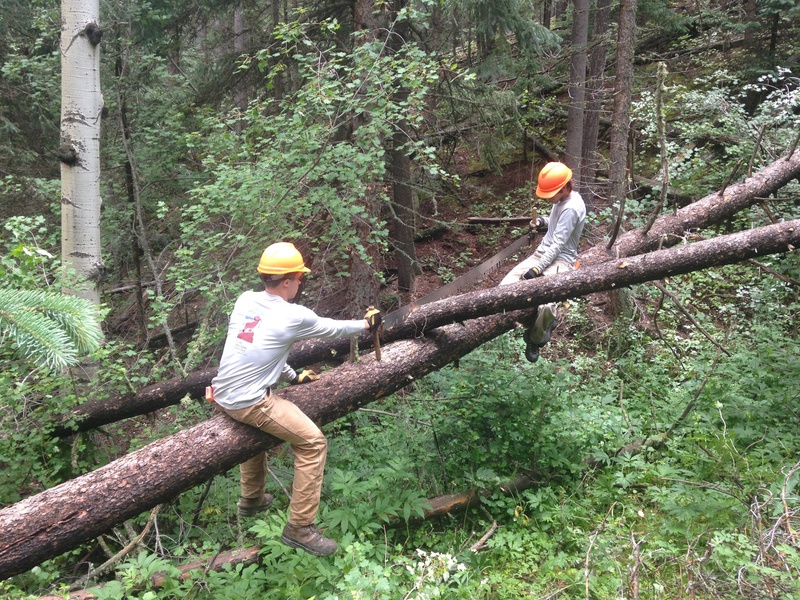 Delaney​’s crew would work along side the Revegetation/Exotics crew, while Tom’s crew would return to the Trails crew. 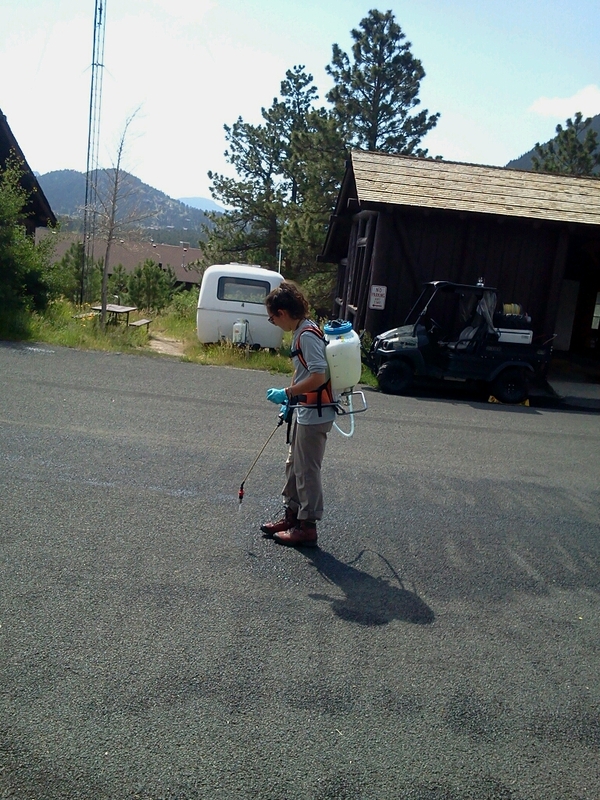 As of Monday morning, Delaney’s crew would become familiar and certified in the application of herbicidal spraying. Furthermore everybody on the crew was instructed to “calibrate” their packs. 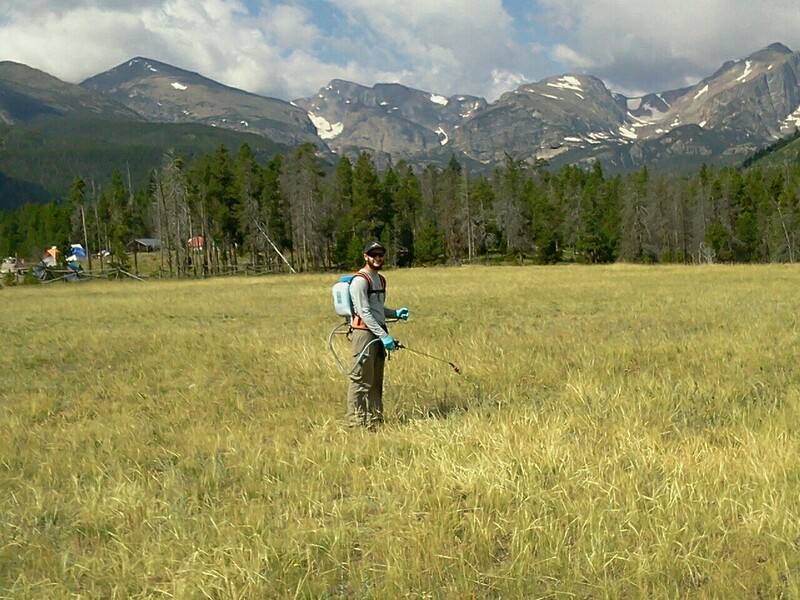 This was completed in order to determine how many gallons of herbicide each individual would spray in an acre plot. This was a vigorous task due to the fact that the pack had to stay pumped up in order to continually spray. 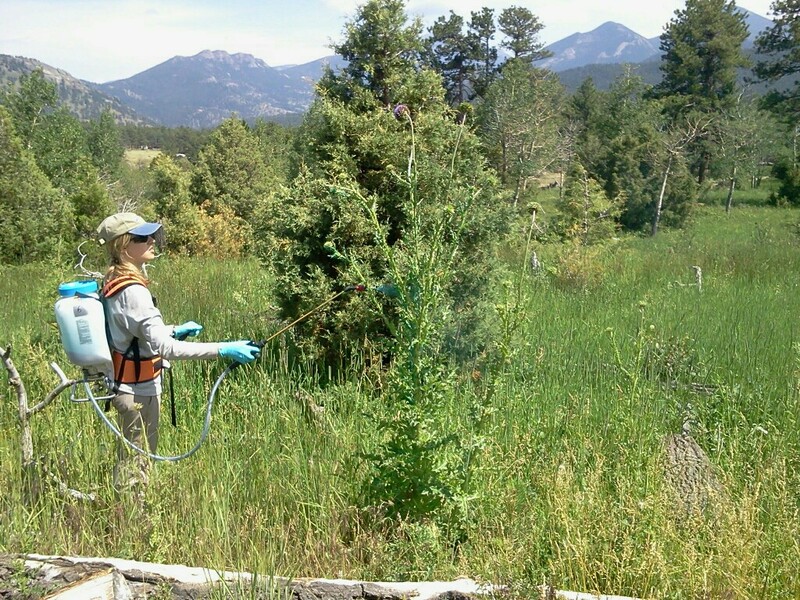 The rest of the day the crew worked on spraying invasive thistle species in Moraine Park Campground. 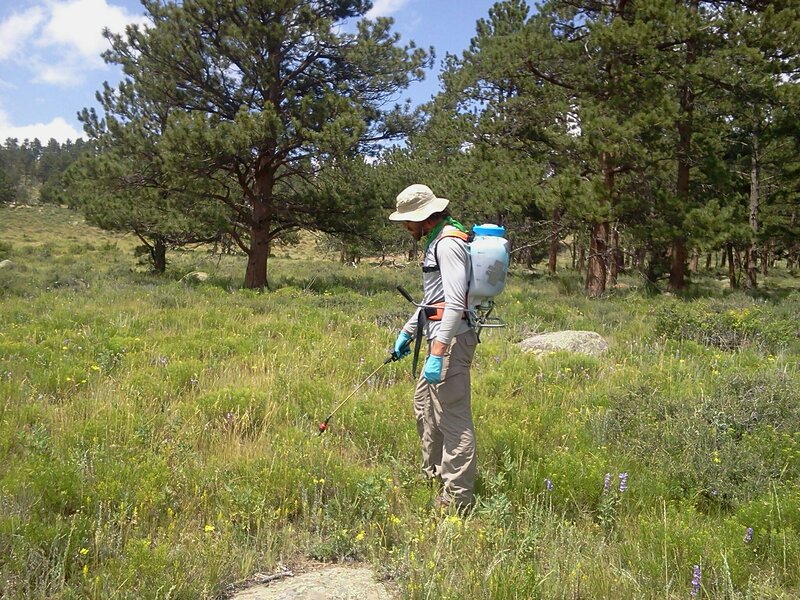 Throughout the next two days the crew worked on spraying the Moraine Park and Glacier Basin Campground for invasive thistle species. On Thursday, there was a change of pace and the crew was instructed to help with the removal of hoary alyssum around the trails barn. It was a successful week of work and each crew member was very interested in learning more about invasive/native species of plants. 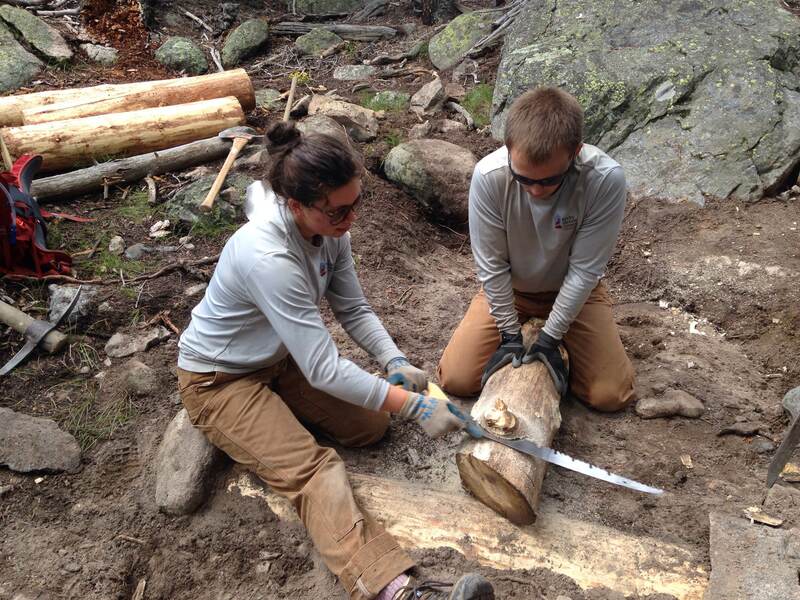 Our Rawah Crew completed another week of backcountry work in the Rawah Wilderness. 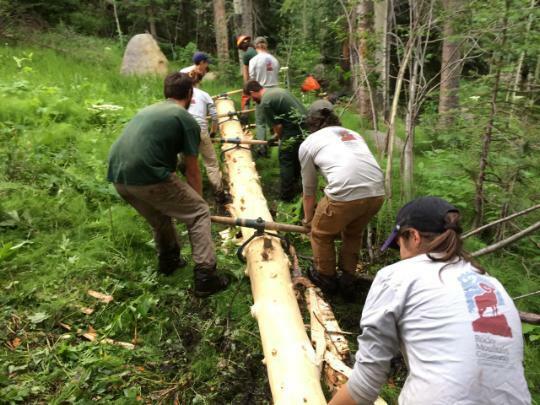 Last week, they spent their time on the Blue Lake Trail completing dozens of log outs and insuring the trail corridor and tread remained safe a sustainable for visitors. Shadow Mountain Crew will be featured in the crew spotlight this week. Stay tuned! With only one week left in the season, I have traveled out to see all the crews and a feeling of melancholy and surprise of the season’s end is pervasive. It has been a great season so far. I can’t wait to see what work they find themselves in this week!